So where were we, oh yes, the swim be prepared this is a long post. I was going to post this tomorrow but a few friends are waiting so here goes, part 3 will be tomorrow. I love swimming and I was comfortable as I entered the water. I had a plan to do 2:30 per 100m or just over 1:30 for the swim. It was foggy on the lake and cool but I knew that would soon change but I was going to enjoy it while I could. I was in the last wave starting at 7am and it was a large wave. I stuck to my plan and thought I was having a good swim, not too much pushing or being kicking in the water and I was sighting well (my Garmin map says I was as well). At one point I saw another swimmer struggling with her goggles and I pointed out a nearby kayak for her, I told her to keep moving forward and thanked a nearby volunteer for being there, I was having fun. I was very surprised to see my Garmin said I swam almost 4.2k, almost 400m over the distance and my swim time was 1:43, about 11 mins over my goal time; I had the pace I wanted, I just swam long?, this is not usually the case. I saw my friend Sylvie at the exit and gave her a hug, we had stood there last year cheering on the swimmers and there I was this year, it was surreal. I started running to transition and my thoughts turned to Neale, was he still in the water? I saw Stephane, my friend who I was watching 3 years ago doing this race when I decided to do it. I gave him a quick hug and told him this was all his fault and ran on. I saw Anita who told me Neale was still swimming (he started 6 mins before me) but she would wait for him and I ran the long red carpet to the change tent. It is hard to change into dry clothes quickly and to make sure you did not forget anything. Helmet, gloves, shoes, sunglasses, sunscreen and onto the bike, one of the last ones left in transition. I saw Anita as I left bike transition and she told me Neale was out of the water just behind me so I could relax and focus on my bike. I felt good, it was still foggy and I did what I trained to do, ride easy on Monte Ryan, high cadence and not to push my gears. I turned onto the highway and there is a few small hills and then the big descend at Lac Conception, I love that hill, well the way down anyway. As I was flying down there was a lot of cyclists going up and I knew I had to go that soon but I was enjoying myself now. On the highway I started to eat and to make sure I was drinking, fuel and hydration would be key today. It was windy on the highway and I tried to stay in aero as much as possible except when eating and I felt good. It was starting to get hot but I was enjoying my day. As I headed back onto Monte Ryan I started getting a cramp in my left foot, it was painful but I just kept flexing it in my shoe and I hoped for the best. I headed up Duplessis, the hardest part of the course and by then it was noon and really hot. I saw Anita and Andre on their long run and Neale on his way back down the road. He was doing great and looked happy. I finally made it to the turn around and my time was slow, over 4 hours and I was not happy. I knew I could do this 90k loop in 3:30-3:40, I had done it in training several times and it was worse than the 70.3 race last year. I saw my Mom and Stephen at the turn around and I think I said that this was F’ing hard and headed to special needs. I got to special need to restock my fuel and I had a chance to stretch my foot properly. I also had a cramp in my right side and it was really uncomfortable. At this point my head started to get very dark and all the negative thoughts started to enter, what was I thinking, I could not do this, I had not improved at all, I was hopeless. I fought with myself down Monte Ryan, I could do this, I had time, I knew I had worked hard and improved, it was not a fun time to be in my head. As I turned onto the highway I had to stop again for water and to stretch my foot out, I have a high pain threshold and it had me in tears. By this time it was really hot on the highway, it was hitting you from all directions and felt like an oven. I knew it was now about chasing cut off times and I could not remember what the cut off time was at LaBelle. As I reached the cut off I asked what the time was and I made the cut off by 20 mins, on to the next one. At the next aid station I stopped again for water and ice and to stretch my foot, I was so hot and so dejected. I don’t think I can describe how I felt, I was happy I made the cut off but so hot and unsure if I could make the next one. My wrist and fingers had started to swell as well and I was worried I might be doing myself some harm being out there. I decide to go from aid station to aid station and assess how I felt as I went and try to make the cut offs. As we left another cyclist either lost her concentration or momentarily blacked out and veered to the left and almost was hit by a police car on the far shoulder. I knew I was no longer thinking straight and felt like I might overheat; the only thing that kept me going was fear of missing the next cut off. I climbed the La Conception hill and stopped at the aid station at the top. By this time I was at the bottom of a black pit of despair, I would not make the next cut off and I might be violating the #1 rule of MediaStyle...do not die. I saw a medic who cut off my wristband as my wrist was so swollen and I took another bag of ice. 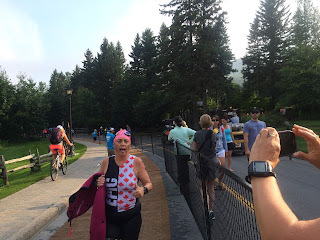 I asked him how long to the cut off and he said 90 mins and I knew I could not do the last 36k in that amount of time and I did not want to do Duplessis again for nothing, I was done, I was going to quit, I was so upset. Another cyclist was also there and told me we had 2 more hours and we could make it. At that moment I decided I would not give up, I wanted this so much and I would keep going until they pulled me from the course or I fell over. I clipped back onto my bike and rode as fast as I could. By this time there were few cyclists left on the course but the volunteers were there cheering me on and that helped a lot. Slowly I was able to push the negative thoughts out of my head and focus on moving forward as fast as I could. I had asked friends to post positive messages for the run course on Facebook and my blog and I started to remember these words as I rode, so many people were rooting for me; I felt every bit of it. I thought of my family and everything they went through to help me get here, my business partners and team at MediaStyle and how they believed in me and I though how I would feel if I had to tell everyone I gave up, I did not want to give up, I had done that before in life and I knew it would stay with me for a long time and undo all the hard work I had done the last 6 years. As I turned onto Duplessis for the final time, having made the cut off once again by about 20 mins, I knew I had to keep going, as fast as I could. I had to walk up the final hill but I reached the turnaround with 20 mins ish to spare, I had a chance, a small chance but I would take that. I knew this part was a lot faster than the up and I pedaled with everything I had. No point in saving my legs for the run if I missed the cut off, that last 5k was my second fastest leg of the bike, I was giving it everything I had. There are 2 hills on this last section, one done and an official said I had 18 mins and I could not stop. On the second hill another cyclist fell over just in front of me and I had to quickly unclip to avoid hitting her or falling myself. I walked around her as officials asked her if she wanted to continue and I quickly got on my bike, I had a cut off to chase. I had to make a sharp right hand turn at the bottom of Duplessis to get to transition, I knew I had to slow down but I could not afford to slow down too much. I hung on, feather my brakes and hoped I would not hit rocks or dirt and made the turn and pedaled with everything I had. 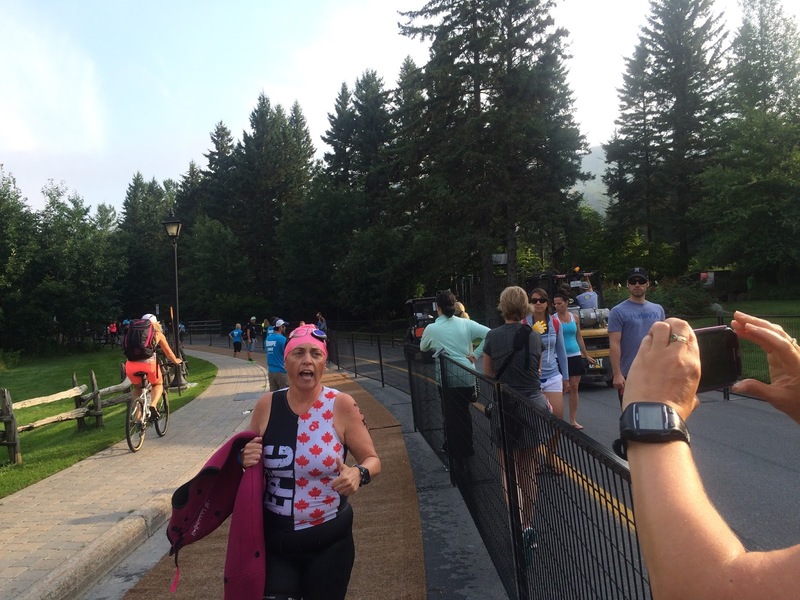 I made it to transition before the cut off, the last person in, later I found out it was by 47 seconds. I saw Stephen, who looked relieved, dismounted my bike and gave it to someone and ran. Suddenly Kory was there again telling me I could do this, I could run a tough marathon and I believed her.